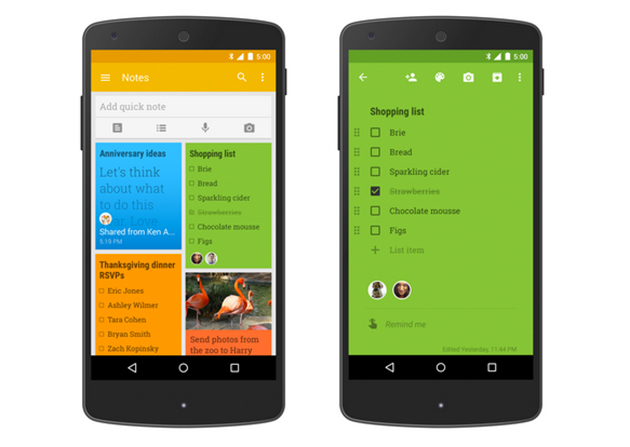 Will iOS Get a Notes App Like Android's Keep? Do you think Apple should update Notes? Discussion in 'iOS 8' started by Starfyre, Nov 17, 2014. It looks so simple and easy to use, the only problem with it is you can only get Keep notes off of the device if you sync it to Google. Apple's notes app is better in that you can back them up to the computer without syncing to Apple, but couldn't they make the interface and utility even better than it is now? What are your thoughts, do you think Apple's notes app is due for an upgrade? Somehow I'm fine with a Notes App being more lightweight, and not creeping toward word processor levels of complexity, allowing checkmarks, pics, etc. There's already a somewhat redundant Calendar/Reminder feature for that, and Pages if I need to go heavier (though I think I wrote about half a novel on the Notes app once back in 3Gs days...) Or am I missing what makes this distinct? Google Keep is pretty. But I still preferred other apps when I was on Android because it focuses too much on form over function. Who wants to write against a green/blue/red/orange/yellow background to begin with? Evernote gives you the list/check box options & more. I'm actually partial to Microsoft OneNote, which also does all that, plus syncs beautifully with my Macs, Windows VMs and my Surface Pro 3. Kinda indifferent. I am using drafts for note taking on my iPhone. Metro is terrible, as far as a desktop interface, though I too have not tried it on a phone. I'm not a Metro fan though, overall. If Windows had managed to generate some sort of genuine improvement to their existing interface that wasn't Metro, I might not be posting from a Macbook Air right now. It's unbelievable that there would be any sentiment of envy toward it to me, as I'd still rather have an actual concise list of items, rather than a huge fricking box that takes up the whole screen to say one word to me, which is my interpretation of that design language. Is the phone interface not also called Metro? I'm not talking about that Windows for PC Metro thing. That was awful. I'm talking about the Windows Phone OS. Windows has changed the name if their hand-held device software I have no idea any more. I couldn't even keep track back in the day when I was using Windows' phones. I'll second Evernote. Very versatile/customizable and paid version has a lot of features. The free is all most of us will ever need. I usually use Notes for small notes/reminders I can pull out of my pocket. Not photos, not event-planning, and definitely not redundant features that requires me to fiddle around with the app. Here are some examples of my glorious note taking skills. nah because they rely on you not liking their notes app and buying one from the app store where they get their 30% cut. Apple have zero incentive to improve their own apps because it would mean a drop in profits. Sounds like the way I use Soulver. Evernote is actually quite slow for when I want to quickly take notes or refer to one. The widget in iOS 8 helps a lot, but it's still quite cumbersome when I want to locate a note. I'd have to disagree about the "simple" part. It looks cluttered. You have to look at iOS through the eyes of a non-tech savvy user. That UI would confuse the heck out of my father in law. Google Keep has been updated since this was written. It is better than anything else on the market. I wish it was an app available on iOS, but alas, I think it is the type of app that violates Apples rules because of Keeps functionality and ability to automatically back itself up to your Google account. Between location based reminders, voice notes auto transcription, multiple people now able to share and edit notes, auto backup, and integration with Chrome it is really an amazing little app. You choose the background color. It defaults to white though.